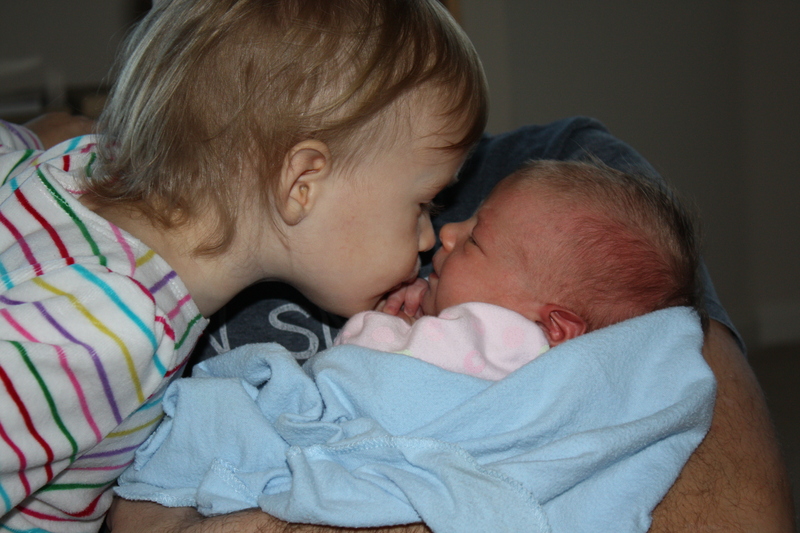 In light of writing a few weeks ago about how hearing normal, uncomplicated birth stories can help soothe a pregnant mother’s fears, I decided that it may be appropriate to include the birth story of my first daughter. I wrote it shortly after her birth. At the time, my husband and I had just been introduced to the world of natural childbirth, so we found a practice with nurse-midwives who delivered in a local hospital, took a Bradley Childbirth class, and prepared as best we could. Keep in mind that nurse-midwives are different than midwives in that they are also trained as nurses in hospital protocol and procedure. I will admit that, when I think about it, I am still frustrated with the nurse-midwife for reasons you will discover. And upset about the “hospital protocol” that took my new baby away from me after only a few moments of skin-to-skin cuddling. However, I did experience a natural birth in a hospital setting, which may be what you are hoping to achieve. I kept thinking I was in labor a week before my daughter was born. Every day around noon I’d start having contractions that got stronger and closer throughout the day and night, but petered off early in the morning. Then they started all over again the next day. On Sunday night we went to the hospital in possible labor, but decided to go home early in the morning when nothing happened. Finally, on Tuesday night, labor really started. 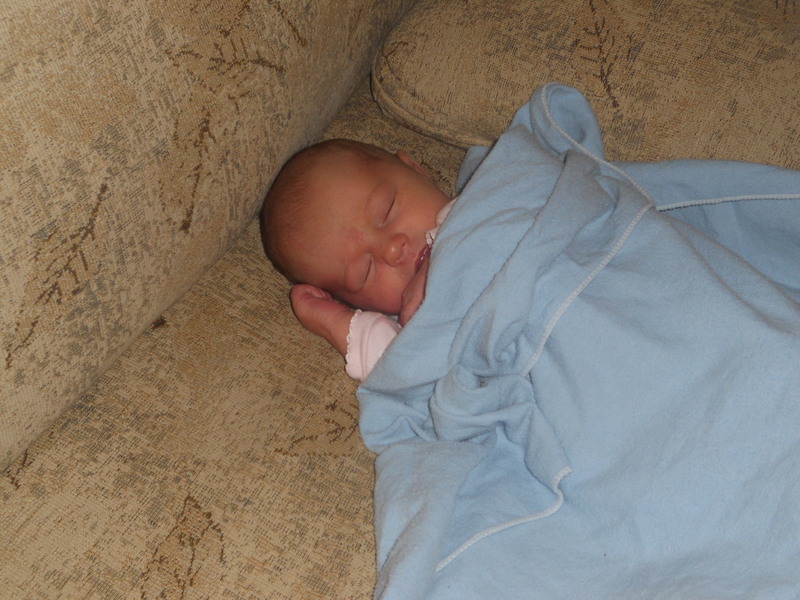 After trying to induce through natural methods such as walking, etc, hard contractions started around 11 p.m. My husband and I went to bed, knowing that I wouldn’t sleep through having a baby, and that we’d need all the sleep we could get. For the next two hours I got up with a few of the stronger contractions. At 1 a.m. I felt my water break, and barely made it to the bathroom. My husband asked me if I was okay. Well, I think my water just broke. He said, you should call the midwife now. So I called the midwife on duty that night (who was the only one of the four in the practice we didn’t want), and she said to come on in. Can I stay at home a little longer? You can, she said, but since your water broke and your contractions are three minutes apart, we recommend that you come in soon. So my husband got everything ready, and I sat on the bed, breathing through contractions. We took our time, and arrived at the hospital at 2 a.m. A nurse got me a wheel chair to sit in and my man checked us in. I sat, relaxed, and couldn’t believe it was actually happening. I mean, I knew it was time, but I didn’t feel ready to be a mother, or believe that all the long months of terrible pregnancy were finally at an end. We had the same nurse as when I had the false labor, and she said I looked much more serious about the whole thing than the last time we were there. We gave her our birthing guide, and she said she’d ask before doing anything. I let her put in a buff cap, even though I hate needles. She checked my vitals, and the baby’s, and monitored my contractions. Wow, she said, when I look at you I can’t tell when you’re having a contraction. But when I look at the screen your contractions are peaking at the highest level. On a scale of one to ten, ten being the worst pain you’ve ever felt, what’s your pain level during each contraction? Maybe a four or five, I replied. I started to feel excited because, if these were considered strong contractions, then I could definitely do this! Once the nurse was satisfied baby and I were both doing okay, she unhooked me to give me some freedom. I had wanted to walk around to speed up labor since my mom’s labors were all really long. But, instead, I didn’t feel like doing anything except soak in the jetted tub. Half an hour later I was in it, soaking, and started to feel a little desperate. I was feeling nauseous, like I was going to throw up. The pressure on my pelvis got a lot stronger, and, suddenly, I felt like I didn’t want to do this anymore. Labor was too hard, I either wanted the baby to stay in there so I could go home, or have them cut her out of me. Either way, I was done with this whole labor deal. Then I checked myself: I was having all the signs of transition! But it was way too soon! There was no way I could be in transition already! It hadn’t been long enough! I decided to not mention any of my emotions to my husband, because I didn’t want him to think I was in transition, since there was no possible way I could be. But it turns out he knew anyway because I was having all the physical signs as well, and he didn’t want to say anything to me either. It took me what felt like forever to get out of the tub and put my gown back on. The contractions were so hard and so close together that it was really difficult to do anything. I still had it in my mind that I wanted to walk around and speed up labor (ha-ha), but, again, didn’t feel like it. So I laid down on the bed in a side relaxation position, listened to calming music, and my husband told me a story. He had just finished and the midwife had just walked into the room for the first time, when I had one last really hard contraction, then felt like I had to push. Um, I think I should push now. That’s what we want to hear! said the nurse. I sat up a little bit, my husband supported me on one side and the nurse on the other, and I pushed with the contractions. The midwife wanted me to hold the baby down with each contraction, I didn’t want to, but I compromised and did a little of both. After a while I had an overwhelming desire to sit up and squat, but the midwife said I was almost there and I should just keep pushing. I got pretty annoyed, but was too busy giving birth to argue, and definitely couldn’t sit up without help. When baby started crowning, I took it easy because I wanted to stretch without tearing. The midwife told me I had to push harder and longer, because she didn’t want to have to do an episiotomy. What?! I thought. That’s ridiculous! But, it really didn’t matter anyway because my beautiful daughter came out with her fist up next to her eye, and tore me pretty badly. The moment of birth will forever remain a surreal, golden, grainy photograph in my mind. I felt her come out and saw the top of her head as the midwife lifted her up. I looked at my husband, he kissed my forehead, then my baby girl was suddenly sprawled across my chest, with a perfectly-shaped head and smooth skin. I don’t remember if she was crying or not. I think she wasn’t, but all that’s vivid is the way she looked. She didn’t look at all like the pictures of newborns one usually sees. She wasn’t purple, or pruny, or have a cone-head. But she was tiny. And a lot more squirmy than I thought a newborn baby had any right to be. The nurse took her away much too soon, because she said my baby needed to be warmed up. I knew it would have been best to just throw a blanket over us both, but my voice was still lost somewhere else in this silent movie so I could only watch. I have no idea what the nurse did, my eyes were only for my family, over at the warmer. My husband and my daughter. I felt like I was someone else, watching the three of us from somewhere outside the room. My man, with his broad shoulders and camera in hand, and stormy-sea eyes gazing at his child. Our daughter, with her miniature fists still held close to her elvish face like a boxer and her tiny eyes squinted closed against the warmer light. And me, hair escaping from a ponytail, face turned toward them, being stitched up and wanting them back next to me. The nurse finally gave my baby back, but all swaddled and hatted. I hated that. I wanted to take her out and cuddle her and feed her and look at her. Not have her bundled up and hidden from me. After a while, when the nurse and midwife had finally left us for a few moments, my husband asked me what we should call her. Oh! She does need a name, doesn’t she. Jayna or Natalie, I replied, hoping that he liked Natalie, a name he didn’t like before because the meaning didn’t make sense. Natalie Grace. It sounds good. Natalie Grace, our ‘born on Christmas’ baby, met the world at 5:47 in the morning, to the piano rendition of Hushabye Mountain. She weighed 7 pounds, 3 ounces, and was 20.5 inches long. Her eyes were grey, her hair exactly my shade of brown, and her toes looked like monkey feet. A spring blizzard stormed outside that day, but we didn’t notice.